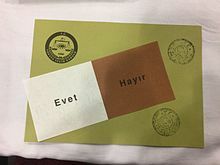 The Independent Turkey Party (Turkish: Bağımsız Türkiye Partisi, BTP) is anationalist and Islamic political party founded on 25 September 2001 by Prof Dr. Haydar Baş. The party flag is red with a white crescent surrounded with a ring of white stars. BTP has a new economic system, the National Economy Model. This system says that money is the counterpart of labor and production. The states should intervene in the market shall. States should use their own independent money. If states want to be giant economy, economy must grow continuously, so that the government should encourage consumers to consumeg. The National Economy Model is the only consumption-centric analysis in the world. In the June 2015 general election, the BTP received 96,465 votes with no parliamentary seats.